Graphics creation was once the domain of graphic designers. For large projects, graphic designers are still an indispensable resource. However, with the proliferation of blogs and the rise of new, image-based social media platforms (i.e. Pinterest and Instagram) companies and individuals are seeing the benefit of creating their own graphics. There are plenty of options out there for creating graphics, but for many businesses, and especially small businesses, the best options are often found online. By having an online solution, it is available everywhere (almost) and anywhere (again, almost). This convenience did not use to be available, even if a company decided to create their own graphics. There was a need to have the “graphics machine” desktop computer to use for those graphics. How many of you are born graphic designers? Yeah, that’s what I thought. Don’t feel bad; I’m not a graphic designer either, even though I used to teach graphic designers how to use Photoshop. But, here’s the thing. You don’t have to be a graphic designer to create awesome graphics for you and your business! You don’t have to take difficult classes in how to use tricky software! You can use templates! 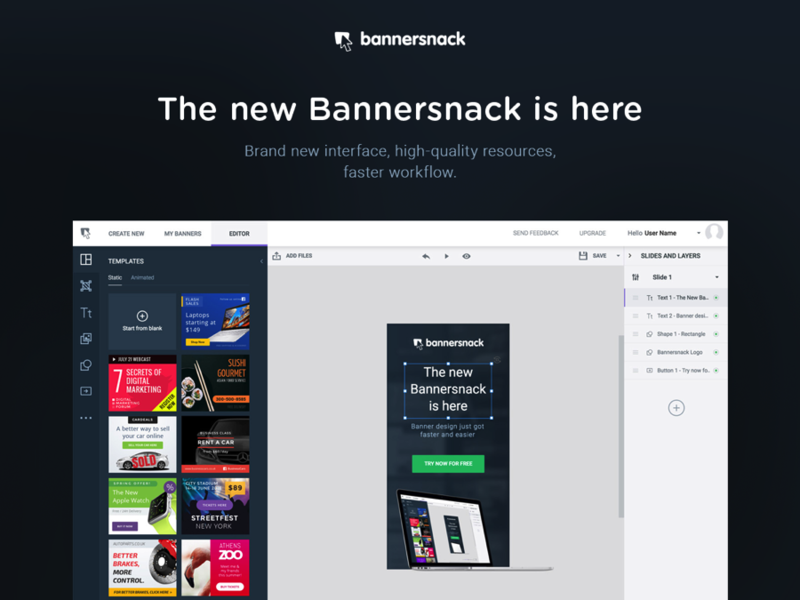 For example, our featured online graphics tool, Bannersnack, offers amazing templates. 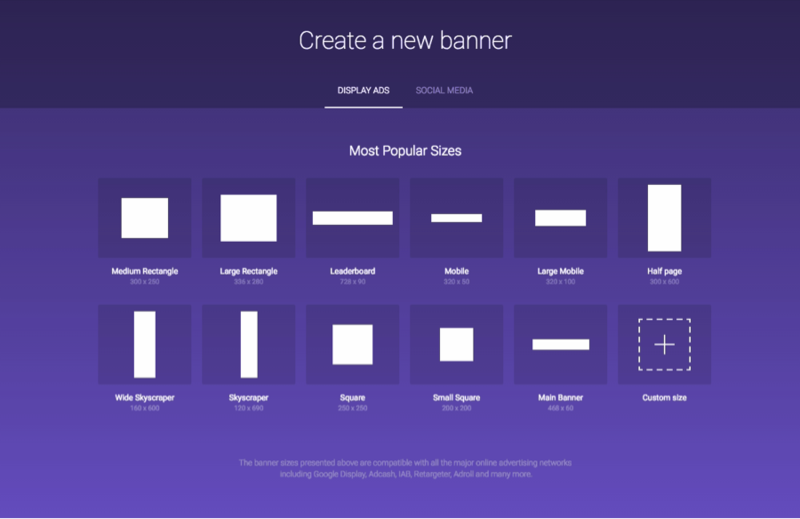 By doing that, Bannersnack is doing the heavy lifting for you and all you have to do is click a few buttons to customize what you like and off you go. 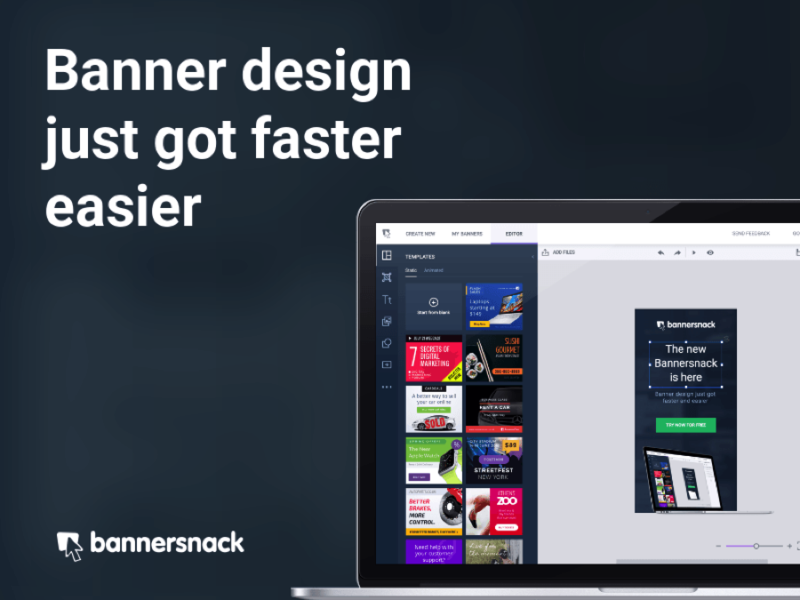 That allows you to feel that creative “feel good” feeling that comes with creating something, but letting the tool (in this case, Bannersnack) do all of the hard work while you use the professional templates that they have already created for you to use. You can use the same template the next time, or try a new one. The sky is the limit when you are in sync with Bannersnack. Online graphics tools are affordable, their interface is often dynamic and easy to pick up, and they offer a range of options that makes unique graphics creation a breeze, even for the non-designer. When you purchase downloadable graphics software, often the price tag can be shocking, especially if you want it to be a desktop-only software and not “in the cloud.” Many programs available for download or through a software retailers reach into the hundreds of dollars. If you want the entire suite of graphics software, it could go as high as into the thousands of dollars. That used to be “normal.” People and companies didn’t question it because that was the way things were if you wanted quality graphics. These programs are still good for large projects and professional photo editing but tend to be financial and functional overkill for the needs of a small business or a startup business. Online graphics tools often function on a subscription basis, with consumers paying a set monthly amount for access to the software. This allows considerable flexibility and affordability for an indispensable service. We mentioned Bannersnack earlier and they do well in the affordability department with a price level for every need or want. They offer three pricing tiers so that business owners can ensure they are getting exactly the tools they need without going broke in the process. It is also an online, available, and affordable graphics program. Unlike downloadable graphics software, online tools often have a very small learning curve. There are no layers and complicated interfaces here. Online graphics tools are geared toward the everyday consumer who has little to no graphic design training or experience. The process is often straightforward and largely self-explanatory, without any of the technological jargon that is so common in graphic design software. Also, most online graphics tools offer high-quality customer support that is available immediately. Sites like Bannersnack often offer an online chat service so that if you are stuck or confused, a trained professional can help walk you through the process. The key to any effective design is its ability to grab the eye and drive traffic and business. Graphics are meant to be eye-catching, engaging, and to communicate clearly with their intended audience. The beauty of online graphics tools is that they offer a multitude of options to ensure that those goals are met. Background graphics, fun text options, and innumerable borders and elements lend themselves well to myriad design options. The best programs offer the ability to customize a design quickly and easily, and to change it just as quickly and easily. As businesses find more and more of their clientele coming from the internet, graphic design is becoming more necessary in the toolkit of any successful business owner. The good news is that, with online graphic design tools, there is no need to outsource the work to a graphic design company. Powerful tools are at your fingertips, easy to use, and at the right price. Thank you for the insight to using online tools for graphic design. I will try this next time. nice article, i will try this . keep update . nice idea i will must try this. Thanks. Instagram is one of the great methods for doing better SEO, thanks for sharing this wonderful post about how to create them onlinee. Yes, Instagram is becoming more and more popular. Very good point. Thanks. Wow! This is one great rich content article. I had fun reading. Apart from it, i learned lots of ideas. Thanks a lot for this. Thanks, Mike! 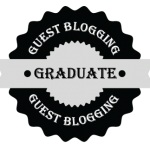 The feedback is much appreciated and essential in what we do as bloggers and writers. Thank you, again. Thanks for sharing this informative and inspirational article.I have a niche blog and this content is so useful for me. Hello, Juliana. I’m glad you found this article inspirational. Thank you for your kind words. Your perspective towards using online tools for graphic designing is really great. I would try these out. Thanks for sharing. Hello there. I hope that you find these tools helpful. I used to teach professional graphics and I have found the online tools to be helpful, as well. It is the one of the best skill take to be a professional designer ability and lesson.Due to help of these instructions i will create a website and get awesome benefits form this. Thanks, Noor. Are you studying and practicing to become one of our next great designers. That is great. Thank you, Nitishk. And, thanks for sharing the interesting article (link). That definitely sounds like a needed topic. Great idea! i am sure i will try it. Oh good, Somia. Do let us know how it works out for you. this is really amazing article. Online tools are really good and can do wonders coz we don’t need to install them in our computer so no need for installing them and they are available 24/7. This is very knowledgeable article. Thanks, Laura. I agree that it is really helpful when we can access tools via the web and not have to install them on our computer. I think the only concern would be whether that tool remains available online. At least, with software, there might be a chance to continue to use the software that one has purchased, even after the company has gone out of business. But, there are always risks and that is life, eh? Thanks so much, for sharing with us, Laura. Thanks….For given the lots of information. I’m glad you found it helpful, Sachin. Thank you.